Here is the complete rappresentation of the Douglas DC-3, a fixed-wing propeller-driven airliner with tailwheel-type landing gear. Prior to the development of the DC-1/2/3 series, scheduled air travel was noisy, relatively uncomfortable, and something that could only be afforded by the wealthy. The DC series changed all that by providing comfortable, realatively fast and reliable air service. What’s more, the type was easily converted to military use by adding a reinforced floor and a cargo door. As such, it was pretty much the primary cargo type for the US and Allies during WWII with thousands built. These planes also formed the basis for renewed passenger air transport after the war as surplus C-47s were dumped on the market at a pittance. Many companies were formed to convert ex-military planes into passenger liners. Even today, decades after the plane first entered service, there are DC-3 and C-47s flying in third tier passenger service some place in the world. Complete Douglas DC-3 aircraft package with extra optionn, High detailed texture for a complete rappresentation of the most interesting color scheme. All repaints are taken from real planes, as well. The plane has also realistic stereo sounds.. 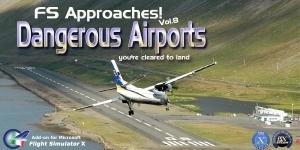 Missions Pack – Missions features Flight briefing, Cabin preparation (Frequencies, Autopilot etc. ), Step by step Check Lists Procedures (pre-start, taxi, before t/o, after t/o, descend, landing, parking) with prompt menu. Crew announcements, speed calls and restriction, Captain speaking, GPWS and much more! PES – (Passengers Entertainment System) – Missions also features the exclusive PES(Passengers Entertainment System), fully customizable with own sound tracks. At the cruising altitude, a Prompt Menu will appear with PES Options. New and unreleased soundtracks inlcuded. This entry was posted on April 26, 2018 at 21:54, and is filed under Perfect Flight News. Follow any responses to this post through RSS 2.0.You can leave a response or trackback from your own site.